Moving to an effective and efficient Continuous Integration/Continuous Delivery (CI/CD) pipeline requires significant effort from organizations. It involves process and policy changes across your entire organization. The payoff can be extraordinary: continual improvement as the organization moves to constantly deliver high quality, well-tested value to their customers. 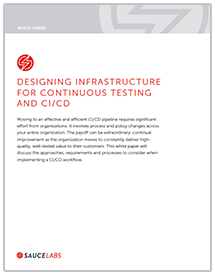 This white paper will discuss the approaches, requirements and processes to consider when implementing a CI/CD workflow.